In person, Robinson wasn’t a dashing figure. His black hair was dishevelled and his clothes were so baggy that they looked as if they’d been sewn in a tent factory. Mail and Empire columnist J.V. McAree depicted him as someone who was always on the prowl, who strode the streets with eyes down, coat flapping and full of newspapers, so lost in thought that he was oblivious to his daughters if they passed by him. He read little more than the Bible, didn’t seem to have any cultural interests, and gave all of his children names beginning with J. 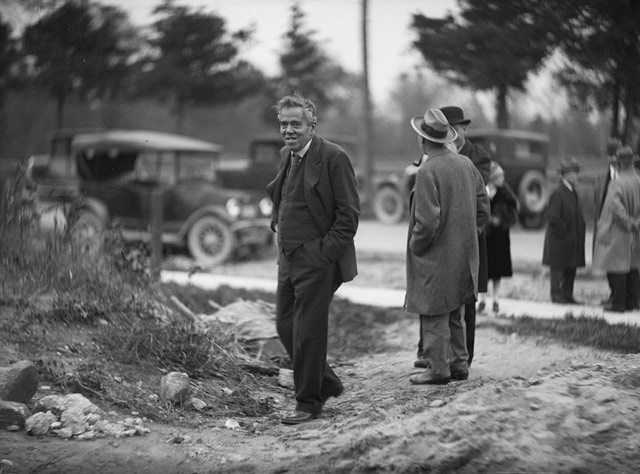 Born in 1862, Robinson’s journalism career began at age 13 when he apprenticed at the Guelph Mercury. Moving to Toronto in 1881, he worked as a reporter at the Globe before joining the Telegram two years later. He developed a strong rapport with Telegram owner John Ross Robertson to the point where they anticipated each other’s thoughts. Both were extremely loyal to the Orange Order and the British Empire, dedicated to exposing municipal corruption, and loathed Americans, Catholics, and Quebecois. “The gospel according to one John was the gospel of the other,” one historian noted. 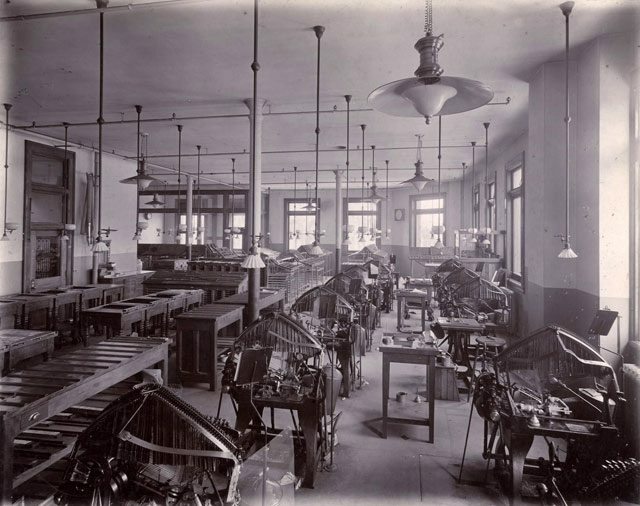 Composing room, the Telegram, 1904. From the Toronto Public Library. Of politicians, Robinson observed that “you can’t appeal to their heads because they have been turned. You can’t appeal to their hearts because they haven’t any. But thank God they all have hides.” Combined with the efforts of the Orange Order, the Telegram shaped city council, often playing kingmaker when it came to mayoral candidates who suited the paper’s view of municipal governance. Some of Robinson’s opponents felt his relationship with City Hall was so cozy that ruled over the city in a dictatorial manner. From the Telegram, December 29, 1923. Robinson was especially loyal to Tommy Church, who received praise so breathless that you’d think he was a god walking among Torontonians. Support of Church reached an absurd climax in 1923, when Church attempted a mayoral comeback after sitting as an MP for several years. Page after page deified Church, printing letters of praise from foreign dignitaries, depicting him as the staunch defender of prohibition and all other things “Toronto the Good” stood for, and printing praise from politicians who’d been dead for years. 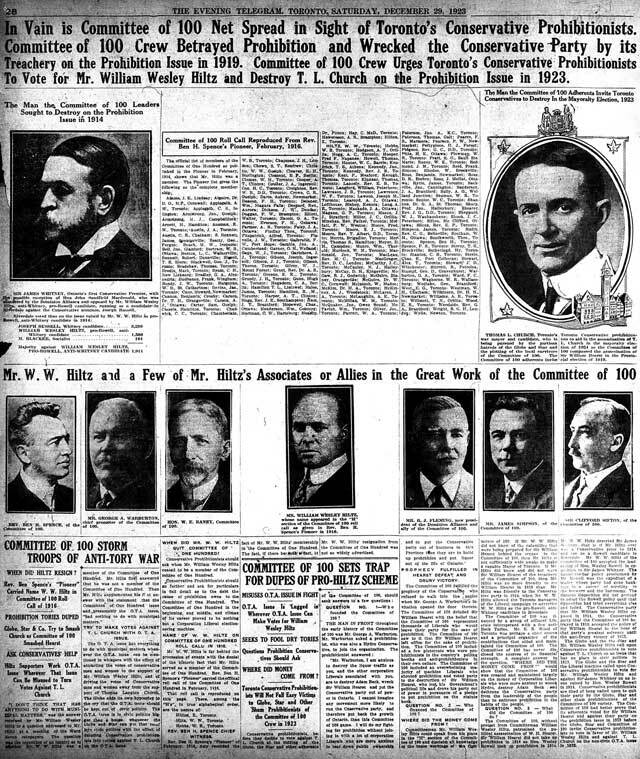 Allies of Church’s opponent W.W. Hiltz were portrayed, under rambling headlines, with photos resembling rows of mug shots, all in thrall to the evils of the Globe, Star, and Conservatives who disagreed with the Telegram’s favoured politicians. ARE WE DOWNHEARTED? Aye, aye, sir, answered the brave tar. THESE COLUMNS STILL RELY ON T.L. CHURCH. New Year’s Day 1924, was ideal except that supporters of T.L. Church seemed to note an acute vote shortage in the closing hours thereof. CHEER BOYS! CHEER for Toronto. Irrespective of who goes up or who goes down at the polls, regardless of the newspapers that suffer defeat or share the victory the civic patriot will continue to PRAY FOR THE PEACE OF JERUSALEM. THEY SHALL PROSPER THAT LOVE THEE. New Year’s Day shipment of adversity duly received, contents noted and in reply would say that Toronto’s loss will prove T.L. Church’s gain. Toronto loses more than T.L. Church loses in the defeat of the best Mayor who ever served a city, and the most faithful defender who ever guarded the rights and property of the citizens. Defeat in the good company of T.L. Church is more glorious than victory in support of any other candidate. Sample front page, the Telegram, December 31, 1923. Nesbitt: You are roaring like a bull. Robinson: And you have less brains than a donkey. Nesbitt (shaking his fist): Don’t think you are going to run this committee. Robinson: Reserve your sympathy for your Austro-Germans in North Oxford. The sergeant-at-arms was called in to restore order. Meeting him on the street [Robertson] would ask, “Well Atkinson, did you make any money last month?” At first the answer was always “No,” to which John Ross would jokingly respond “Better give it up; I’ll give you a job.” When at long last the answer was “Yes, we had a little over last month,” Robertson tipped his high silk topper in benign congratulations and continued his august ambulation. 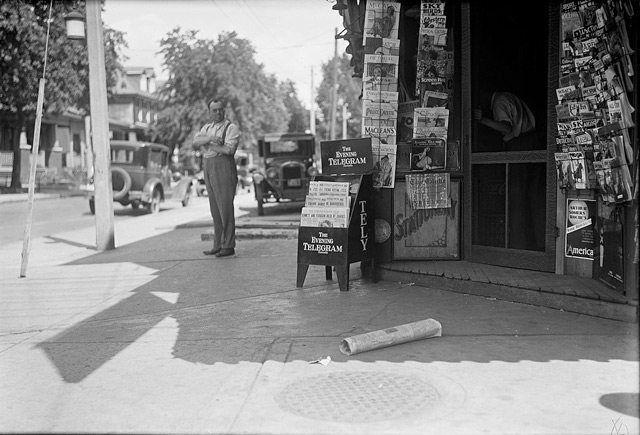 Telegram paper box at 908 Queen Street East, July 23, 1930. FRom the City of Toronto Archives, Fonds 200, Series 372, Subseries 58, Item 1257. After Robertson’s death, Robinson unleashed his hatred of everything the Star stood for. “Day after day Mr. Atkinson was pictured to readers of the Telegram as an evil old man, hunched in his office spinning Machiavellian plots for the destruction of the Empire, Protestantism, and Western civilization,” Harkness noted. “Since the Telegram still had a circulation within the city greater than that of the next two papers combined, most residents of Toronto knew Atkinson only from the distorted picture presented to them by his enemies.” Robinson went to ridiculous extremes to portray Atkinson poorly, such as claiming the Star’s suggestion to widen Bloor Street was based on Atkinson’s desire for a speedier ride between the office and his home in Forest Hill. One of Robinson’s most obsessive crusades was the promotion of public ownership of utilities, especially hydro. Were Robinson around today, you can bet he’d be leading the charge against selling any part of Hydro One. Robinson stood faithfully by Sir Adam Beck and others who believed a publicly run system was better for ratepayers than falling prey to price gouging by private operators. Robinson also backed Beck’s unsuccessful plans to build a network of radial railways out of the city. Following Beck’s death in 1925, Robinson frequently spoke in public about the need to preserve Beck’s legacy amid political squabbling. By the mid-1920s, Robinson’s power declined. 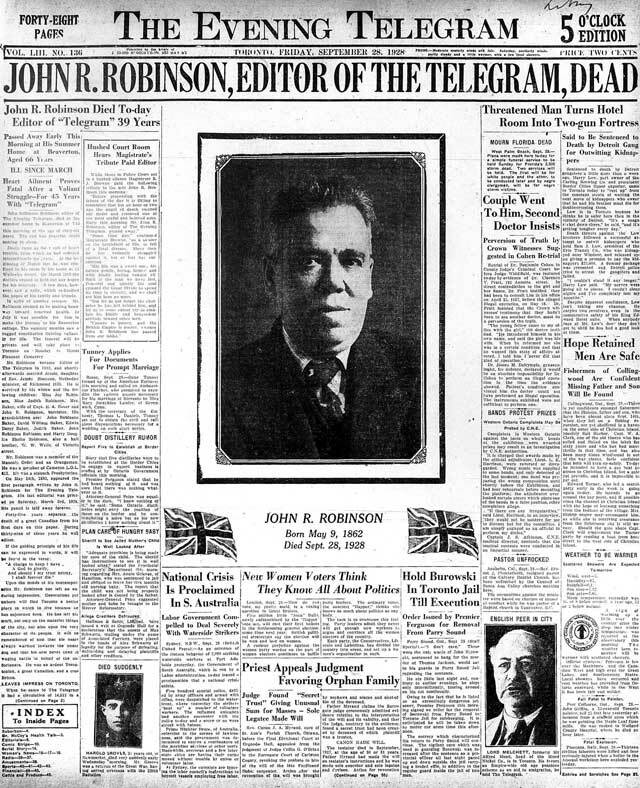 Following Robertson’s death in 1918, the Telegram was passed onto a group of trustees, including his widow Jesse and son Irving. Both increasingly resented Robinson. Jesse was annoyed by his provocation of libel suits, which were unsuccessful, filed by Minnesota lumber tycoon E.W. Backus (for allegations over a sweetheart timber rights deal in northern Ontario) and Prime Minister William Lyon Mackenzie King (for allegations that cabinet ministers had accepted bribes of liquor). Irving resented Robinson’s authority and contempt for his friends. His final editorials appeared in the March 3, 1928 edition. He criticized the vanity of proposed downtown skyscrapers and commented on a public speaking contest at Jarvis Collegiate. He also took a shot at Irving, who considered himself a snappy dresser, by commenting on a recent decision by the Business Club of Nottingham in England to fine a member for wearing plus four pants at a public function. Shortly after, Robinson suffered a heart attack. Initially confined to his Wellesley Street home, he soon moved to his summer home in Beaverton. 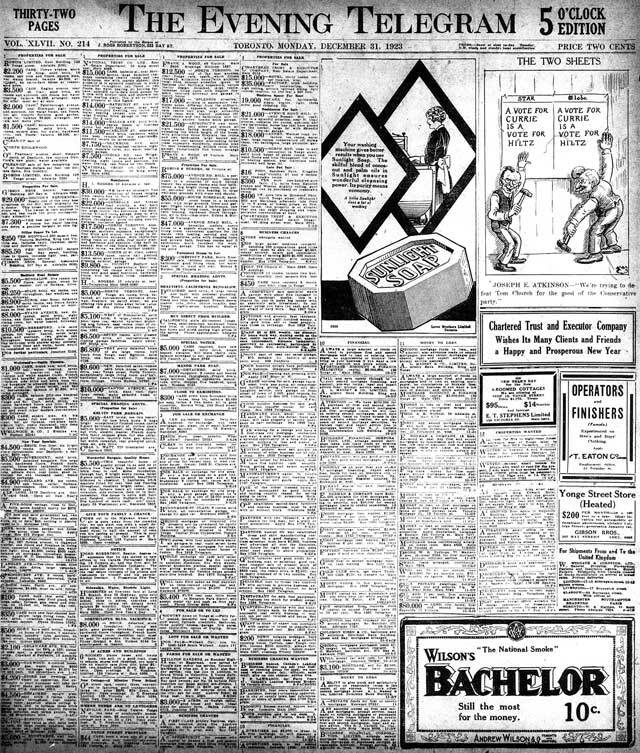 On May 1, 1928, for the first time anyone could remember, the classified ads were removed from the front page. Though temporary at first, the removal of this anachronistic element was seen as a sign of battles behind the scenes (the classified were permanently banished from the front in August). From the Telegram, September 29, 1928. Robinson asked for a simple service, requesting that the only flowers present be ones he grew in Beaverton. Two years after his death, his family presented a portrait to city council, which one alderman request be hung next to Adam Beck’s. Mayor Bert Wemp, a former employee of Robinson, noted that side-by-side they depicted “two staunch friends” who fought for public interests. His journalistic legacy lived on through his daughter Judith (1899-1961), who joined the Globe as a reporter the year after his death. During her distinguished career, she co-founded the Second World War era weekly News, and served as a respected political columnist with the Telegram. Additional material from J.E. Atkinson of the Star by Ross Harkness (Toronto: University of Toronto Press, 1963); The Paper Tyrant by Ron Poulton (Toronto: Clark, Irwin & Company, 1971); A Victorian Authority by Paul Rutherford (Toronto: University of Toronto Press, 1982); the June 21, 1919, September 29, 1928, and December 16, 1930 editions of the Globe; the September 29, 1928 edition of the Mail and Empire; the January 2, 1924, April 19, 1926, and September 28, 1928 editions of the Telegram; and the Spring 2010 edition of Urban History Review.